The early life of this most original and eloquent of French historians passed amidst much hardship and difficulty. His father, who was a printer, had been employed by the government of the Revolution period (1790-1794), and at the political reaction, a few years later, he found himself reduced to poverty. 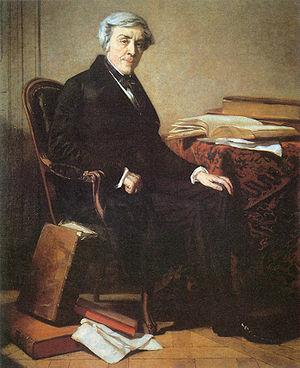 From the experiences of his earlier life Jules Michelet doubtless derived his contempt for the common rich and luxuriant manner of living. Until his sixteenth year, flesh-meat formed no part of his food; and his diet was of the scantiest as well as simplest kind. Naturally sensitive and contemplative, and averse from the rough manners and petty tyranny of his schoolfellows, the young student found companionship in a fe choice books, of which A'Kempis' Imitation of Christ seems to have been at that time one of the most read. At the Sorbonne Michelet carried away some of the most valued prizes, which were conferred with all the éclat of the public awards of the Académie. At the age of 24, having graduated as doctor in philosophy, he obtained the chair of History in the Rollin College. His manner, original and full of enthusiasm, though wanting often in method and accuracy, possessed an irresistible fascination for his readers; and all, who had the privilege of listening to him, were charmed by his earnest eloquence. His first principal work was his Synopsis of Modern History (1827). His version of the celebrated Scientist Nuova of Vico, of whom he regarded himself as the especial disciple, appeared soon after. Upon the revolution of July, Michelet received the important post of Keeper of the Archives, by which appointment he was enabled to prosecute his researches in preparation for his magnum opus in history, L'Histoire de la France, the successive volumes of which appeared at long intervals. It contains some of the finest passages in French prose, he episode of La Pucelle d'Orleans being, perhaps, the finest of all. Having previously held a professorship in the Sorbonne (of which he was deprived by Guizot, then minister), he was afterwards invited to fill the chair of History in the Collège de France. In 1847 his advanced political views deprived him once more of his professorial post and income, in which the Revolution of the next year, however, reinstated him. The coup d'etat of 1851 finally banished him from public life - at least as far as teaching was concerned - for being to conscientious to subscribe the oath of allegiance to the new Empire. Michelet, like an eminent writer of the present day, upon principle, elected to be his own publisher; a fact which in conjunction with the unpopularity of his opinions, considerably lessened the sale and circulation of his books; and, by this independency of action, the historian was a pecuniary loser to a great extent. Deprived of the means of subsistence by his conscientiousness, he left Paris almost penniless, and sought an asylum successively in the Pyrenees and on the Normandy coast. In 1856 appeared the book with which the name of Michelet will hereafter be most worthily associated - the one which may be said to have been written with his heart's blood. That the taste of the reading world was not entirely corrupt, was proved by the rapid sale of this the most popular of all his productions, A new edition of L'Oiseau came from the press each year for a long period of time, and it has been translated into various European languages. How far the attractiveness of the book, through the illustrative genius of Giacomelli, influenced the buying public; how far the surpassing merits of the style and matter of the work - we will not stay to determine; but it is certain that The Bird at once established his popularity as a writer, and relieved his pecuniary needs. L'Oiseau was followed by several other eloquent interpretations of Nature. But the first - there can be no question with persons of taste - remains the masterpiece. it is, indeed, unique in its kind in literature - by the intense sympathy and love for the subject which inspired the writer. It is the only book which treats the Bird as something more than an object of interest to the mere classifier, to the natural-history collector, or to the "sportsman." It considers the winged tribes - those of the non-raptorial kinds - as possessed of a high intelligence, of a certain moral faculty, of devoted maternal affection - of a soul, in fine. Of his remaining writings, La Bible de l'Humanité (1863) is one of the most notable, characteristic as it is of the author's method of treatment of historical and ethnographical subjects. The calamities of his native land he so greatly loved, through the corrupt government which had brought upon it the devastations of a terrible war, ending, by a natural sequence, in the fearful struggle of the suffering proletariat, deeply affected the aged champion of the rights of humanity. Almost broken hearted, he withdrew from his accustomed haunts and went to Switzerland, and afterwards to Italy. He died at Hyères, in 1874, in the 77th year of his age. A public funeral, attended by great numbers of the working classes, awaited him him in the capital. "There is no selfish and exclusive salvation. Man merits his salvation only through the salvation of all. The animals below us have also their rights before God. 'Animal life, sombre mystery! Immense world of thoughts and of dumb sufferings! But signs too visible, in default of languages, express those sufferings. All Nature protests against the barbarity of man, who misapprehends, who humiliates, who tortures his inferior brethren.' This sentence which I wrote in 1846, has recurred to me very often. This year (1863), in October, near solitary sea, in the last hours of the night, when the wind, the wave were hushed in silence, I heard the voices of our humble domestics. From the basement of the house , and from the obscure depths, these voices of captivity, feeble and plaintive, reached me and penetrated me with melancholy - an impression of no vague sensibility, but a serious and positive one. "The devout faith we cherish at heart, and which we teach in these pages, is that man will peaceably subdue the whole earth, when he shall gradually perceive that every adopted being, accustomed to a domesticated life, or at least to that degree of friendship and companionship of which his nature is susceptible, will be a hundred times more useful to him than he can be with his throat cut (qu'il ne pourrait l'être egorgé). Man will not be truly man until he shall labour seriously for that which the Earth expects from him - the pacification and harmonious union (ralliement) of all living Nature. Hunt and make war upon the lion and the eagle if you will, but not upon the Weak and Innocent." "Conquerors have never failed to turn into derision this gentleness, this tenderness for animated Nature. The Persians, the Romans in Egypt, our Europeans in India, the French in Algeria, have often outraged and stricken these innocent brothers of man - the objects of his ancient reverence. Cambyses slew the sacred Cow; a Roman the Ibis who destroyed unclean reptiles. But what means the Cow? The fecundity of the country. And the Ibis? Its salubrity. Destroy these animals, and the country is no longer habitable. That which has saved India and Egypt through so many misfortunes and preserved their fertility, is neither the Nile nor the Ganges. It is respect for other life, the mildness and the [comparatively] gentle heart of man. "To prevent death is, undoubtedly, impossible; but we may prolong life. We may eventually render pain rarer, less cruel, and almost suppress it. That the hardened old world laughs at our expression is so much the better. We saw quite such a spectacle in the days when our Europe, barbarised by war, centered all medical art in surgery, and made the knife its only means of cure, while young America discovered the miracle of that profound dream in which all pain is annihilated. "Woe to the ungrateful! By this phase I mean the sporting crowd, who, unmindful of the numerous benefits we owe to other animals, exterminate innocent life. A terrible sentence weighs upon the tribes of 'sportsmen' - they can create nothing. They originate no art, no industry. They have added nothing to the hereditary patrimony of the human species. . . .
"Do not believe the axiom, that huntsmen gradually develop into agriculturalists. It is not so - they kill or die. Such is their whole destiny. We see it clearly through experience. He who has killed will kill - he who has created will create. "In the want of emotion, which every man suffers from his birth, the child who satisfies it habitually by murder, by a miniature ferocious drama of surprise and treason, of the torture of the weak, will find no great enjoyment in the gentle and tranquil emotions arising from the progressive success of toil and study, from the limited industry which dies everything itself. To create, to destroy - these are the two raptures of infancy. To create is a long, slow process; to destroy is quick and easy. "It is a shocking and hideous thing to see a child partial to 'sport;' to see a woman enjoying and admiring murder, and encouraging her child. That delicate and 'sensitive' woman would not give him a knife, but she gives him a gun. Kill at a distance if it pleases you, for we do not see the suffering. And this mother will think it admirable that her son, kept confined to his room, will drive off ennui by plucking the wings from flies, by torturing a bird or a little dog. "Far-seeing mother! She will know, when too late, the evil of having formed a bad heart. Aged and weak, rejected of the world, she will experience, in her turn, her son's brutality. "Purity, above everything, in regimen and nourishment. What are we to understand by this? "I understand by it that the young girl should have the proper nourishment of a child - that she should continue the mild, tranquillising, unexciting regimen of milk; that, if she eats at your table, she will be accustomed not to touch the dishes upon it, which for her, at least, are poisons. "A revolution has taken place. We have quitted the more sober French regimen, and have adopted more and more the coarse and bloody diet of our neighbours, appropriate to their climate much more than to ours. The worst of it all is that we inflict this manner of living upon our children. Strange spectacle! To see a mother giving her daughter, whom but yesterday she was suckling at her breast, this gross aliment of bloody meats,and the dangerous excitant wine! She is astonished to see her violent, capricious, passionate; but it is herself whom she ought to accuse as the cause. What she fails to perceive, and yet what is very grave, is that with the French race, so precocious, the arousing of the passions is so directly provoked by this food. Far from strengthening, it agitates, it weakens, it unnerves. The mother thinks it fine (plaisant) to have a child so preternaturally mature. All this comes from herself. Unduly excitable, she wishes her child to be such another as she, and she is, without knowing it, the corruptress of her own daughter. "All this [unnatural stimulation] is of no good to her, and is little better for you, Madame. You have not the heart, you say, to eat anything in which she has no share. Ah, well! abstain yourself, or, at all events, moderate your indulgence in this food, good, possibly, for the hard-worked man, but fatal in its consequences to the woman of ease and leisure - regimen which vulgarises her, perturbs her, renders her irritable, or or oppresses her with indigestion. In the same strain an eminent savan, Sir D. Brewster, has given expression to his feeling of aversion from the slaughter-house - a righteous feeling which (strange perversion of judgement) is so constantly repressed in spite of all the most forcible promptings of conscience and reason! These are his words: "But whatever races there be in other spheres, we feel sure that there must be one amongst whom there are no man-eaters - no heroes with red hands - no sovereigns with bloody hearts - and no statesmen who leaving the people untaught, educate them for the scaffold. In the Dacalogue of that community will stand pre-eminent, in letters of burnished gold, the highest of all social obligations - 'Thou shalt not kill, neither for territory, for fame, for lucre, nor for food, nor for raiment, nor for pleasure.' The lovely forms of life, and sensation, and instinct, so delicately fashioned by the Master-hand, shall no longer be destroyed and trodden under-foot, but shall be the objects of increasing love and admiration, the study of the philosopher, the theme of the poet, and the companions and auxiliaries of Man." More Worlds than One. Bible de l'Humanité - Redemption de la Nature, VI. Cf. a recently published Essay, in the form of a letter to the present Premier, Mr. Gladstone, entitled The Woman and the Age. The author, one of the most refined thinkers of our times, has at once admirably exposed the utter sham as well as cruelty of a vivisecting science and demonstrated the necessary and natural results to the human race from its shameless outrage upon, and cynical contempt for, the first principles of morality. The Bird, by Jules Michelet. English translation. Nelson, London, 1870. See, too, his eloquent exposure of the scientific or popular error which, denying conscious reason and intelligence, in order to explain the mental constitution of the non-human races (as well that of the higher mammals as of the inferior species) has invented the vague and mystifying term "instinct." La Femme, vi. Onzième Edition, Paris, 1879.